This project is the counterpoint to our design for a Portable Band Saw Mill. Like it's match, this device empowers woodworkers to harvest their own lumber from urban trees felled due to disease, clearing or severe weather. Unlike the powered version, this device requires that the user provide 100% of the power to do so. For woodworkers who want to get closer to the source of their raw materials, our 6000W electric bandsaw mill is a powerful and effective way to do so. The problem with that design is that — for the woodworker seeking purity — a powered version simply may not be pure enough. For those seeking the highest degree of lightweight, versatility, and simplicity, this design provides it. A certain amount of effort — mental and physical — is required to perform any job. Every product represents a balance of that effort distributed between the tool and the operator who wields it. Products that amplify the effort of humans are empowering; those that supplant this effort can be disempowering over time, as the muscles — mental and physical — that used to perform this work atrophy. The tools of today are so smart that they often encourage this decline, and their manufacturers can now hold customers hostage with products they can't repair or services they can no longer perform independently. For some of us, the most exciting type of design is that which restores the independence of the user — empowering him or her to do more with less — and enables him or her to grow in experience and capability. Products like these include simple hand tools, track bikes, tenkara fly rods, straight razors, hang gliders and many, many more. These simple technologies aren't for everyone. For most of us, it makes more sense to embrace some balance of man and machine that delivers more convenience, safety or time-savings than any of the products listed above. The track bike, for example, provides the purest form of cycling but it does so by forcing the user to apply not just the steering, balance and human power of a conventional bicycle, but to do all without the benefit of brakes, gears or a freewheel. A straight razor is another example. 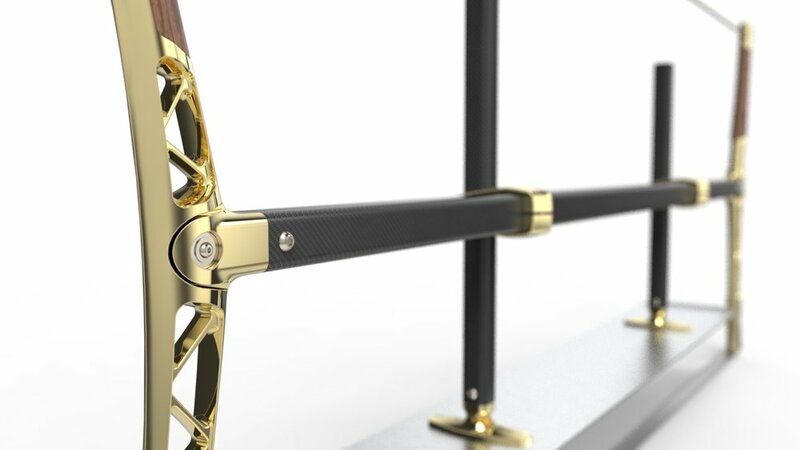 Like the track bicycle, the impracticality of this device is generally high (the author himself has used a straight razor exclusively since 2003 and received eight stitches due to an accident in 2014), but the reward often returns more than just ideological benefits. Over its useful life — which may last more than a generation — a straight razor can save hundreds of high tech, multi-material disposable razor blades ("monstrous hybrids") from the landfill and keep thousands of dollars in the pocket of its owner. For our convertible frame saw, the goal was to demonstrate this by providing a pure, simple alternative to our own portable saw mill. Like many devices of great purity, this design offers enhanced performance in some ways but with a massive trade-off — the user has to provide 99% of that performance. This simple design will be lower cost, have fewer parts to break, weigh less and will be transportable to any location with no need for external power. With its simple design and no need for power — electrical or fossil fuel — this device should deliver the ultimate purity (short of making your own) in a lightweight, high performance package. Users who purchase it will enjoy both sustainably harvested lumber and an intense Rocky 4 style workout. 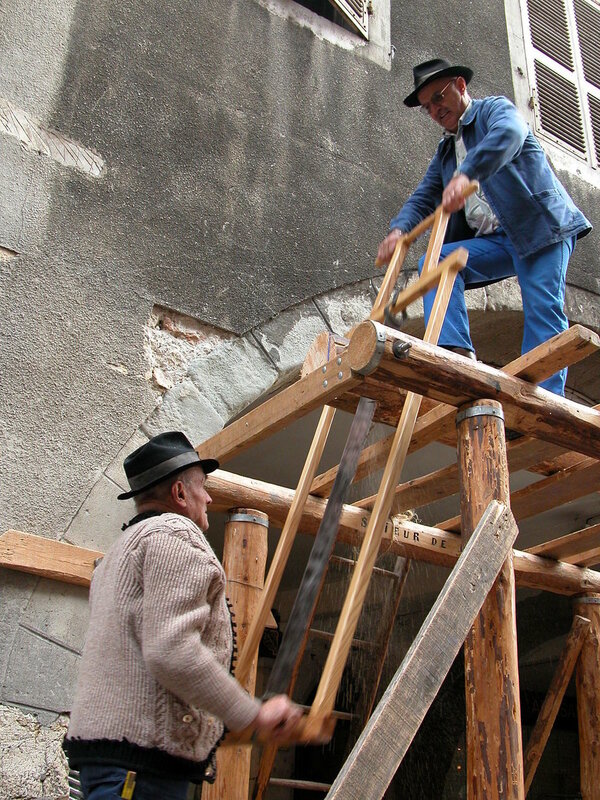 Like the Roubo saw pictured at right, as a milling device, this saw requires two users and should be ordered extra long to receive maximum benefit from their largest muscle groups. This design was completed in parallel with that of the Portable Bandsaw Mill and shares several of its features and components. 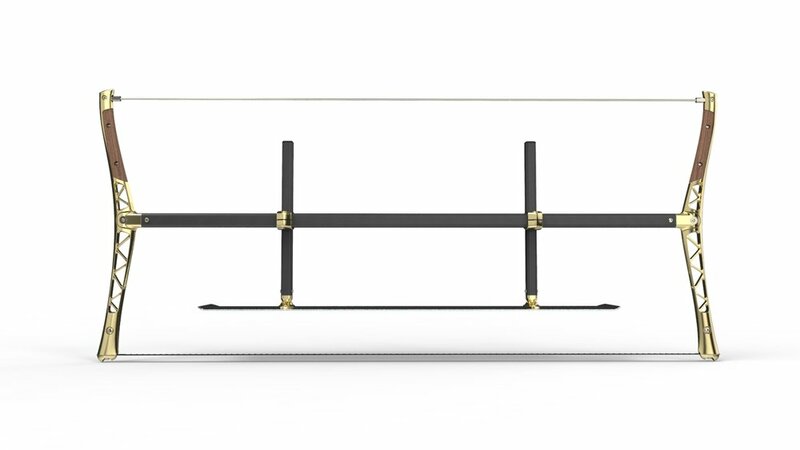 Like the bandsaw mill, this device was inspired by a traditional frame saw. 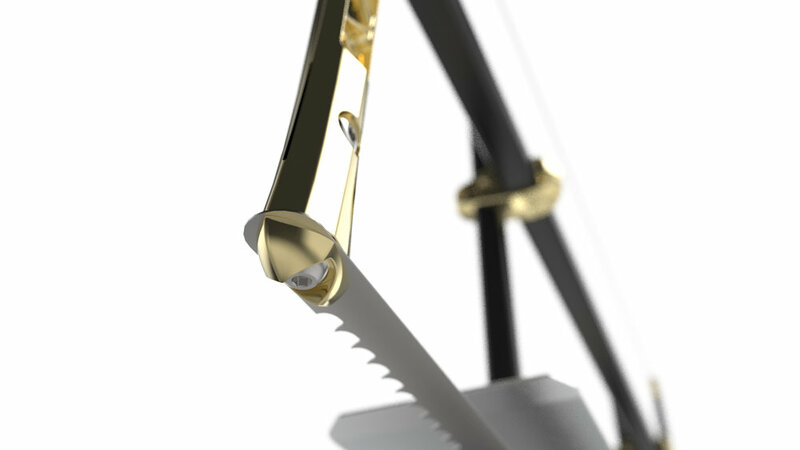 Unlike traditional examples, this saw can be reconfigured for ripping or crosscutting within the same design. By leveraging the strength of machined 6061-T6 aluminum (like the riser of a compound bow) for the tensioning arms and borrowing the depth guide of our portable bandsaw mill, we've created a single design that can serve both purposes. Blades will be available with both crosscutting and ripping geometries and should be sharpened regularly by the user. Set up for off-grid lumber ripping, this device borrows the depth guide components of our bandsaw mill (e.g. the clamps, vertical tubes and plate) to position the blade at a set depth along the face of the log. The guide mounts to the same square, carbon fiber compression tube as that of the bandsaw mill, and like that device, a pivot at each end allows the blade to be tensioned using a stainless tension rod stretched between both handles. In this format, the blade is mounted on three pins sandwiched by a cap at the base of the handle. To set the saw up for crosscutting, the user simply removes the depth guide and exchanges the ripping blade for a crosscut blade of the same length. 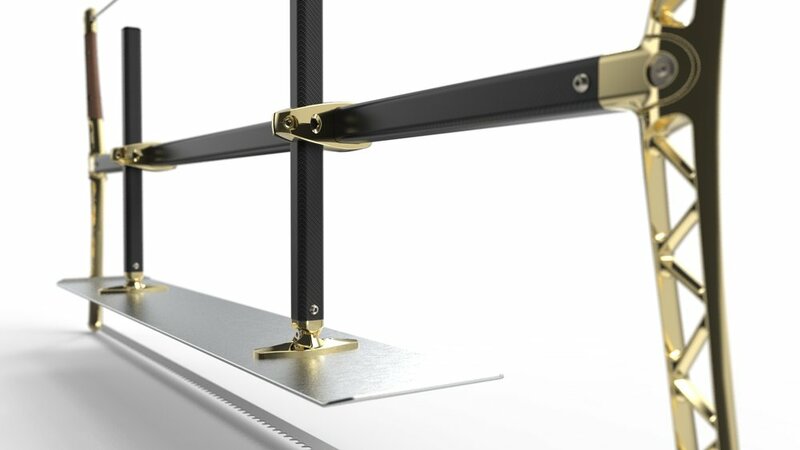 The crosscut blade is mounted within a narrow, (wire EDMed) slot near the base of each handle. 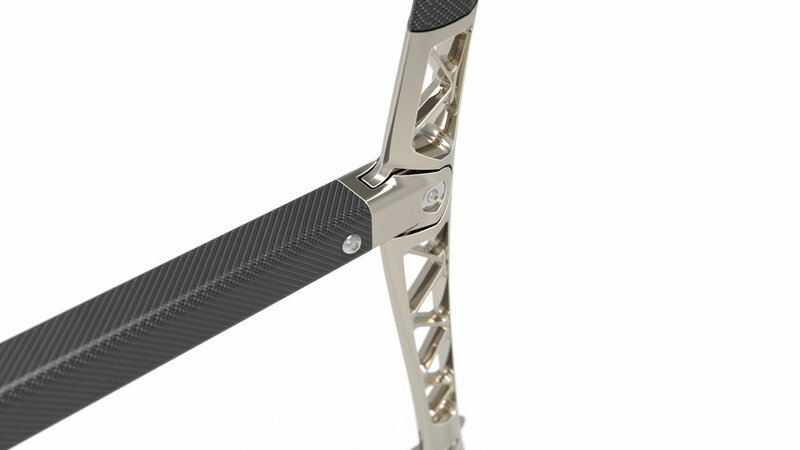 In this format, the entire saw is simply a pair of machined risers (with pivots), a carbon crossbeam, blade and tension rod. These aircraft-grade materials should deliver greater blade tension than a conventional wooden frame saw at a comparable weight, resulting in less blade wandering and more precise cuts. Due to the extremely low volumes at which this device will likely be sold, it was important to design it with as few molded components as possible. This reduces the cost of tooling — the debt of which would have to be amortized across every unit. It also allows us to deliver a high quality, made-on-demand device with no plastic components other than the CRP tube. This provides the added advantage of allowing us to customize the device for every customer by offering it in varying widths (e.g. 36", 48" 60", etc.) and finishes. To order, a customer will simply select a finish and a length. 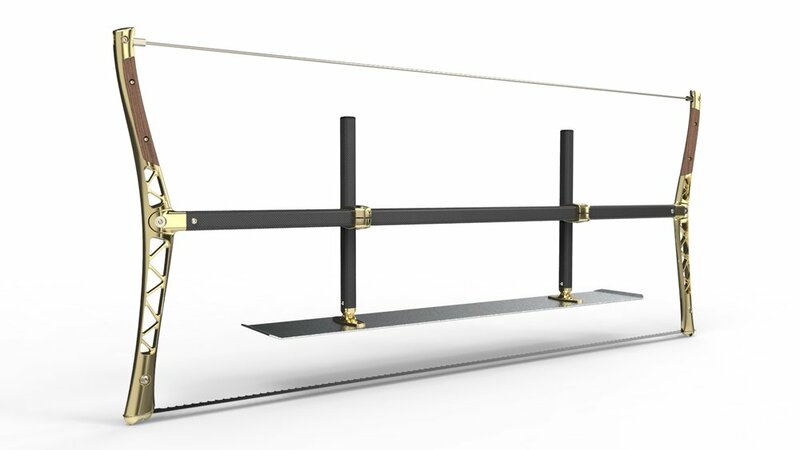 The unit will be shipped in two boxes — one containing the handles and hardware, the second containing the compression tube, blade and tension rod. 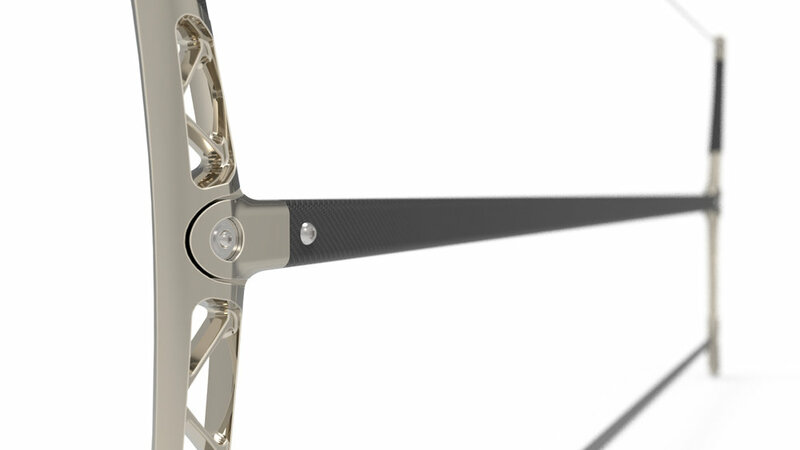 All machined aluminum components will be anodized or plated to customers' specifications, based on a list of available finishes. Flush grips are set into each handle and will be crafted from solid, CNC-machined wood (of the customer's choice) or cast in urethane. The images above show the saw in brass and nickel with walnut and molded handles, respectively. The gallery below shows multiple options for finish and trim. This is not a "practical" device in the same way that a track bike is not a practical conveyance. Despite this, many people in many cities use brakeless fixed gear bikes as a simple, effective and low maintenance method of transportation. They enjoy the purity of their tool and the independence it delivers from fossil fuels and — to a large extent — bike shops (without brakes or derailleurs, there's not much to break). For those seeking track bike purity from their saw mill (and an insane and time-consuming workout), this device may be an answer. For those who still want a high quality, powerful and low impact tool for milling their own wood but who are willing to settle for slightly less purity, please check out our Portable Bandsaw Mill.